Posted October 5, 2013 by Norburn Lighting and Bath Centre & filed under Bathroom Accessories, Bathroom Sinks, New Products . 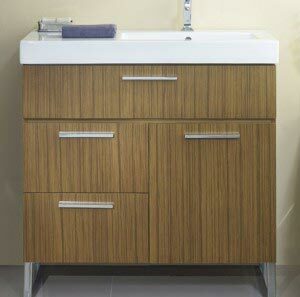 Welcome to the Metropolitan vanity collection; contemporary styling with artistry and attitude. Crafted of teak engineered wood in a mellow Ash Blonde tone; or with a Gloss White finish… dressed up with assertive accents of polished chromefinished hardware and chrome-finished metal legs. Modular units in several sizes allow for flexibility in design. This is a look that adds dash to your bath. Fairmont Designs work with talented designers from around the globe, keeping abreast of international design trends, to bring you innovative, fashion-forward furnishings for every room… every need… every taste. Fairmont Designs and operate four state-of-the-art factories with 2.5 million square feet of manufacturing space that produce beautifully designed, sturdy, well-constructed furniture you’ll be proud to own today… and for many tomorrows. As a member of the Sustainable Furnishings Council, Fairmont Designs is committed to eco-friendly business practices to ensure that our furniture is safe for you, as well as the environment. They define success through quality products, but measure our achievement through their sustainability practices.